Welcome to Day TWO of Verve's June 2015 Spotlight Hops! Wasn't yesterday's hop just fabulous? If you missed it, you can click here or scroll down, and comment on all of our spotlight hops until June 21. There's a chance to win new products each day, so be sure to hop around and leave a little love for the oh-so-talented Divas and special guests this week! Everything we preview this week will be available in the Verve online store on Friday, 6/19. So come hop along with us and see what's new at Verve! Want to win some shiny new Verve? We'll be picking a random commenter on one of the Day 2 Hop spots to win today's featured products! Our prize drawing will be open until 8pm Mountain on Sunday, June 21. Just leave a comment on the blogs linked below and you'll be entered to win! You should've arrived here by way of Julee's beautiful blog, but if not...that's where to begin this awesome hop today as we feature the new DECOR BORDERS stamp set! This new set, Deco Borders, is SO FABULOUS! I rarely stamp backgrounds because of my impatience and difficulty lining up images...but, this set makes it EASY!!! I used the diamond border image in four colors (pink, green, yellow and orange) to create a partial background and topped it with the ornate border before adding a piece of vellum to soften it a bit. You know I love layers, so I added cluster of yummy Build a Poppy Die Set blooms, Dreamy Leaves Die Set foliage, and a sweet Pastel Polka Ribbon Collection bow...all nestled together over a Deco Borders sentiment stamped Vintage Oval Die and embellished with Pink Sparkle Sequin Mix. Next stop is Teresa's amazing blog! See you tomorrow for more peeks at this awesome release! Colourful mix of DP's that make this a fun card! I almost missed the sequins, until I saw the close up! Cute card with a sparkle. Wow another great card love it. What a beautiful set. Your amazing card shows its versatility. What a beautiful set. Your amazing card showcases its great versatility. Love all the layers! Looks like this new set is very versatile! Just gorgeous, Stacey! 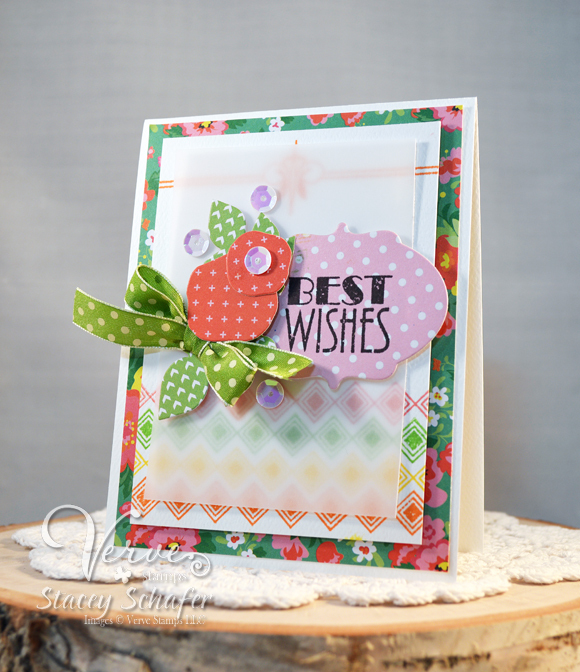 Love those colorful borders behind the vellum and the way you arranged those poppy dies is FABULOUS! Great way to use the new border stamps. Love your card. This is so cute! Love all the different papers! Ooh! Loving all of the colors and the polka dots! What a fun, summery card! Love all the patterns and colors. beautiful card!! love how you've used the border stamp..
Amazing how a pop of different colors changes this art deco border. You packed a lot into this awesome card! Love how colorful it is. What a happy card! Very inventive use for the Art Deco images. Yahoo for new Verve. Love your card Stacey! So pretty, love the sentiment and lovely DP you used. Wow - what beautiful use of these wonderful borders and beautiful papers. What a happy colors card - love it! Really like the colorful layout and especially polka dots. A great cheery card to share. what a happy and eye catching color combo, beautiful card! So pretty! Love these stamps! Beautiful colour combo too! So pretty, and what a nice look the vellum adds! Thanks for sharing your beautiful card. Your background turned out wonderfully. Love that background! The vellum adds a softness and those paper pieced poppies are perfect!! oh your card is just so fun and bright!! I love stamping my own backgrounds, these do look easy to use. Sweet! What a fab background those new stamps make!! Your bright, fun colors and wonderful layers just make me smile!! I like the colors and patterns. Such a fun card! Love how you stamped the deco in the background and soften the colors with the vellum. Great card. The colors, and the textures are wonderful. So pretty. Love the way you used your poppies on dp...thanks for the inspiration! Not sure why I always put them on plain cardstock! Great card Stacey! This is beautiful!! Love those patterned flowers. Love how these blooms are made of pp and the sentiment looks great next to them. Love the use of the background stamp in multiple colors of ink! 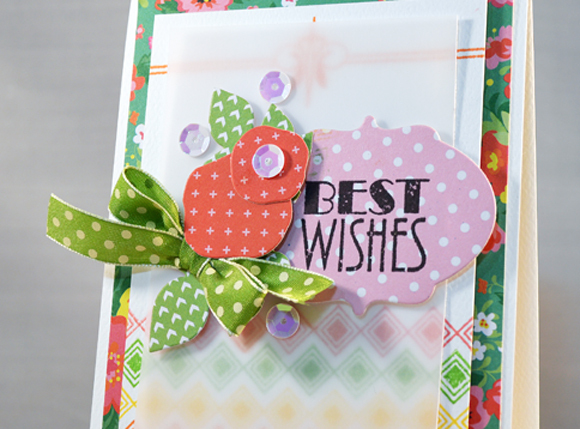 Looks great with its panel of vellum and the fun floral dies! This is a great font in these new sets!